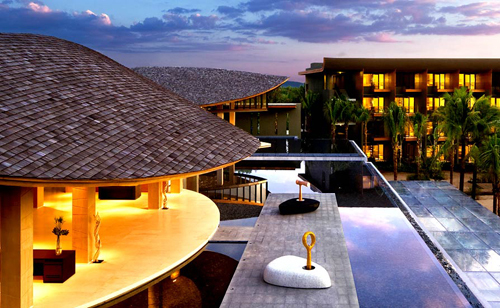 My partner and I have spent our holiday at the Renaissance Phuket Resport & Spa Thailand. I would like to thank you with a little longer review about the TA community for help in finding a hotel. Recommended hotel, food and wines but especially borderline expensive. Great spa. 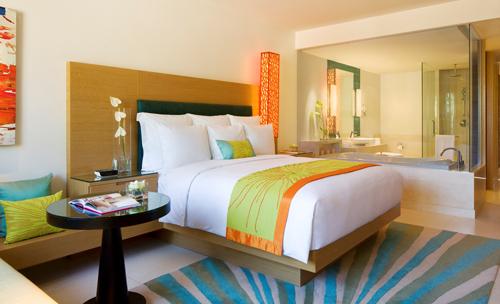 Standard Rooms: The rooms are modern and appealing. The size is sufficient, and a small balcony with two chairs and a side table lends itself primarily to the dry swimwear or for short-term stay. Depending on the location, the rooms are well placed differently, in a wing (left from the reception location) you have some view of the sea (side). The bathroom is open to the glass-walled room, but you can keep with blinds as view protection of privacy very well. There is satellite TV (no German channels), safe, Wi-Fi (extra charge), and MiniBar is enough closets in the room (but they smell something strange. Mosquito repellent?). The air conditioning could be regulated well and was quiet. It is noteworthy that every day 4 x 0.5 liters of water for free in the room gets (for two people). In addition to the rinse water for brushing teeth, the water features as well as free drinking water to (taste OK). It should be noted are the evening (after rain), sometimes quite loud croaking frogs, you should accept it as belonging to nature. 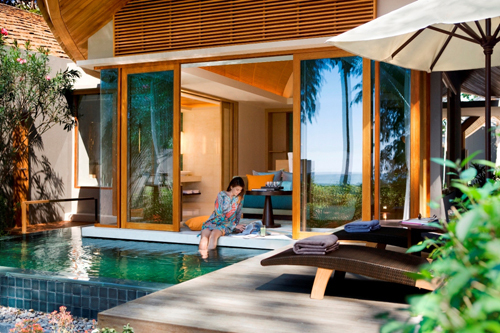 Pool Villa: The pool villas I have not seen from the inside. The situation is, however, at least for the Beachfront Villas beautifully. About the features of the villas I can not give any information. Here we recommend a look at the website of the hotel. The medium-wide and very long sandy beach is directly adjacent to the hotel. The beach is natural, it is therefore particularly in the upper part of the trees quite a lot of needles in the sand. This may be because the whole area is located in a nature reserve (no noise, etc. by quads, motor boats) and shall indicate whether the start of the year there oviparous turtles remain in this form. Further down the beach, the sand is largely "clean." A positive note is the view in both directions. There are no hotels, etc. seen as no disturbing areas of sun loungers. It should reign partly slightly stronger currents in water, this is me not noticed in two periods. Disturbing to me is when two periods (each a few days) while swimming in the sea an unpleasant Pieken / stinging noticed the body. According to my research is here to nässelndes plankton or jellyfish smallest parts. Although this is not painful, but annoying occurrence is well but in many parts of Thailand distributed, partly a cause related to shrimp farms suspected. My partner also felt the sting, but not with the same intensity. This appears to be dependent on the physical reaction. As soon as you leave the water, there were no other complaints. The pool is big enough and modern with views of the sea. The close proximity to the restaurant "sand box" you will unfortunately sonicated involuntarily all day with music. I personally have indeed seen as bothersome prefer, but no matter, as well as directly on the beach and was therefore not further compromised. The hotel has three restaurants. Loca Vore-in addition to the excellent and very extensive breakfast buffet (European and Asian dishes) evening a la carte dishes as well as on some days buffets are offered. In addition to European food (including pasta and meat dishes) also some Asian specialties such as curries are on the map. The buffets are good (plenty of fresh meat and fish, prepared and brought to your table by choice), but unfortunately not very varied. Both of the location near the beach and from the Asian restaurant interior Takieng is recommended. Here, only Asian specialties. It is probably to the highest quality restaurant on site. In the sandbox (below the Takiens) daytime and evening salads, grilled meats and even pizza (yum! ), and pasta are offered. Recommended for a snack between breakfast and dinner, the Café Doppio, etc. with various sandwiches (yum), coffee, tea and fresh smoothies. The aforementioned bar near the reception for drinks in an open atmosphere with a view of the system. In darkness, quite nice here but I personally would have preferred a bar right on the sea definitely. A special highlight was the stay in the spa area of ​​the hotel. Before the treatment, you will be treated to a refreshing drink, and after treatment with a very tasty ginger-lemongrass tea. The charming and beautiful buildings are various massages (All information subject to, in each case subject to 10% service charge and 7.7% tax: including Thai massage 90 minutes 73 euros; Hotstone and Deep Renewal 90 minutes 90 euros for 60 minutes. each purchase, but not significantly less) offered by appointment. The treatments are best combined with the bundled offerings (eg 60 mins foot reflexology for 35 euros in combination with another treatment or the great Scrubs). The facials are, according to my partner, no must-have. Of course, the prices are not comparable to treatments in massage parlors site, but the quality is outstanding and definitely without any disreputable flair. Nice is the ability to be shared with the massaged / partner will of a room. An overall very good hotel with slight limitations in pricing due to food costs. The hotel is for people who want to come into the enjoyment of the Thai nightlife unsuitable because of its remote location. For all other vacationers who like me are looking for relaxation and rest, but definitely recommended. I expect that we will again spend hours at the hotel our vacation.